Laurence Fishburne III (born July 30, 1961) is an American actor of movies and theater, playwright, director, and producer. He was nominated for the Oscar, and won the Emmy and Tony Awards. He is famous for his roles in successful movies like Apocalypse Now and The Matrix. Fishburne was the first African-American actor to play Perry White in Man of Steel. 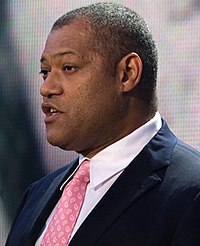 Fishburne was born in Augusta, Georgia and moved to Brooklyn, New York City during his childhood. This page was last changed on 15 August 2018, at 13:54.